I'm far more familiar with the Genesis/Master System version of Alien Storm than the arcade (or Master System). I play it regularly on the portable SEGA Genesis player that I keep on my nightstand. Such a great game. I love side scrolling beat 'em ups and SEGA made some of the best during their glory days. 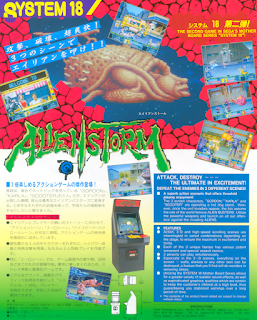 Alien Storm is a little different in this genre as the fighting is done mainly with shooting weapons. There's a variety of game play as well, shooting areas like in Shinobi or even a few running while shooting spots give the game breaks in action to keep you on your toes. Saturday night, after my wife had fell asleep, I played good old Alien Storm until I ran out of credits. Got pretty far too. It's a shame the game never got any sequels or has a better legacy. Though it's regularly available on various compilations or on e-shops, so at least the option to play it is still present.